Biography & Genealogy: Edmond Pendleton Taylor, Class of 1876. Genealogy: Born- Sept. 27, 1854 in Orange Co. Va. Father- Erasmus Taylor; Mother- Roberta Ashby. Pat. Grandfather- Edmund Pendleton Taylor; Pat. Grandmother- Mildred [maiden name unknown] Mat. Grandfather- Robert Ashby; Mat. Grandmother- Mary [maiden name unknown] Married- Virginia M. Gildersleeve. Children- one daughter, Mary Ashby Taylor. 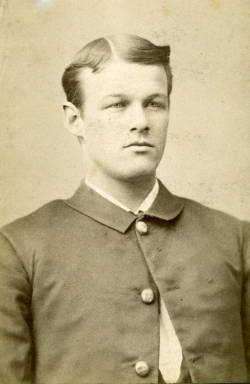 VMI Record: Entered VMI- March 7, 1872; Graduated- June 29, 1876 standing 23 in a class of 35. Careers: Farmer and engineer. Died- Sept. 23, 1911 in Orange Co. Va.